interact in a simple way and ask and answer simple questions. providing absolute beginners with a solid foundation for learning. You the teacher will need the New Headway Beginner student's book, the New Headway Beginner workbook, and also the New Headway Beginner class audio. 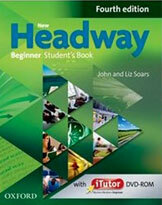 and the New Headway Beginner workbook. concept in using the New Headway Beginner course to teach English, and when you complete our course you will feel confident in teaching even advanced students. excellent quality when teaching English over Skype.